To start off the week yesterday morning we formulated a trio of fresh options idea to track, and we can gladly announce that all three produced the opportunity to net multibag gains. Our options ideas have been as good in 2019 as any time in our eight year history, and we ain to keep that trend going! Fresh Options Ideas – In addition to continuing to keep an eye on the previously mentioned plays, we will also add to the pool with another couple of ideas today. In these cases we are going to go bearish. Domino’s whiffed on earnings and revenue in its premarket release today, while same-store sales increased only slightly. Meanwhile, the high profile injury to Duke basketball player Zion Williamson last night caused by a Nike shoe malfunction, has the potential to have a deleterious effect on Nike’s stock in the near term. 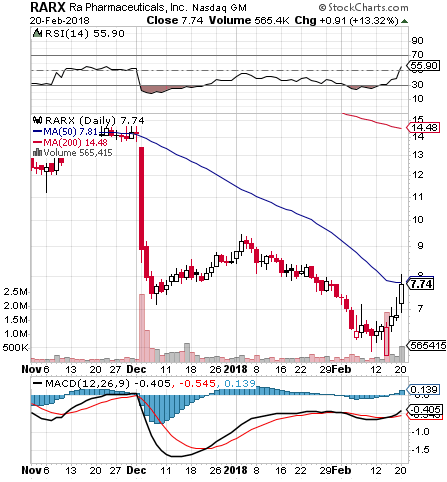 Ra Pharmaceuticals, Inc. RARX – The first of a pair of NASDAQ-listed stocks with nice chart setups, RARX has actually been building a solid recovery trend off of its bottom since last week. A couple of Form-4 filings around the same time show two huge $15M blocks purchase by two separate insiders at the stock’s lows. Meanwhile, there’s still a fair bit of ground to recover from what it has lost in the past ten weeks or so. RARX flirted with its 50DMA yesterday, so we’ll be looking for a break past that point, with indicators on the chart suggesting a fair chance of that happening. 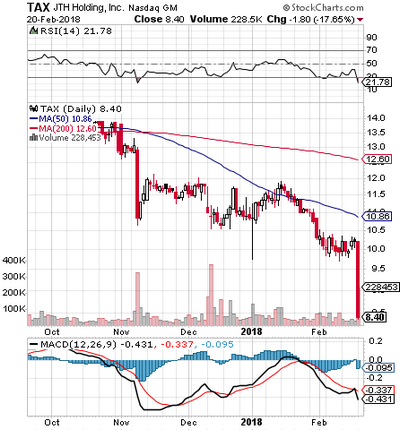 Liberty Tax, Inc. TAX – We’ve also noted the recent bludgeoning of TAX, which has been in a general downtrend for the better part of five months. In this case, we haven’t reached bottom-bouncer status yet, but more of a bottom-watch. At present, the stock is now heavily oversold, on the heels of the dismissal of its CEO. With tax season upon us, this is the time of year that we’d expect companies such as TAX to do their highest volume of business, so now seems as good a time as any to track this play for a bottom-bounce. The last time we talked about AAP was a few months back, and we managed to find some nice gain opportunities within the AAP options chain following the company’s strong quarterly report. AAP reported quarterly earnings once again this morning, and we thought we’d take another crack at it, by signaling the AAP 03/16 $105-115 Calls for observation.